Where could today's adventure take you? Hiking up a snow-dusted hill, navigating icy downtown streets or puddle jumping on your way into work. 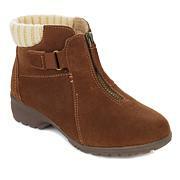 Whatever your day has in store, get through it with style and warmth when you're wearing these ankle boots from Sporto. With a water-resistant exterior and a Thermolite-insulated insole, you'll stay warm, dry and comfortable all day long. This shoe runs large allowing for better heat retention. I ordered both my regular size and one size down. 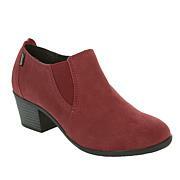 My regular size was roomier, having a wider ball and toe area and heel as well. The size down fit like my regular size in other Sportos. After being on my feet all day, I tried both pair on with thicker, warmer socks. My feet were pressing against the outside of the size down. I decided to keep my regular size to allow for swelling, thicker socks, and better air circulation. Love them! Bought these for my granddaughter as a Christmas present.They fit her perfectly and seem warm in Ohio 32 degree weather.They made me a winner. Warm light weight, a Great Color For me!